Some 15,000 children have over the previous week fled the western section of Iraq’s Mosul city where fighting between the Government forces and terrorists is intensifying, the United Nations Children’s Fund (UNICEF) has reported. 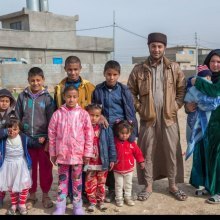 “UNICEF is responding to the immediate needs at the Hamam Al Alil camp, 20km from Mosul, where aid is provided to children upon their arrival,” UNICEF Regional Emergency Advisor Bastien Vigneau said over the phone from Iraq during the regular press briefing held in the UN Office at Geneva. He noted that the children were very scared of the sound of the bombs, which was one of the main reasons their parents had decided to flee. They fled with very little luggage and in most cases with a bare minimum of clothes. The children and their families arrived mostly by buses organized by the military. The main priorities, other than the first emergency response, included health, to ensure that children were immunized, primarily against measles and polio, said Mr. Vigneau. Matthew Sarmash, spokesperson for the Office of the UN High Commissioner for Refugees (UNHCR), said that a significant increase in displacement had been noticed in recent days and the Hamam Al Alil camp was close to reach its maximum capacity. At the moment, 150,000 places were occupied. He said construction is under way to accommodate up to 250,000 people there. UNICEF’s Vigneau said that more than 100,000 children have been displaced from Mosul since the military operations against the Islamic State of Iraq and the Levant (ISIL/Da’esh) began on 17 October 2016. He said that 874 unaccompanied or separated children have been identified since mid-October, with half of them reunified with their families or taken care of by extended families, and the others being provided dedicated assistance until they reunify with families.